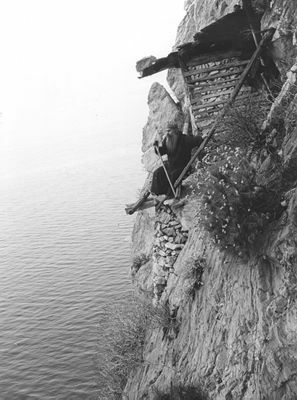 Karoulia is located at the southernmost shore of Mount Athos on a rocky and very steep site. The hermit monks have built their huts inside caves, holes and rock protrusions. The name “karoulia” (pulleys) derives from the fact that in the old days supplies were delivered to the monks with pulleys. The ten monks are principally occupied with prayer. They have diminished their corporal needs to the absolute minimum. They drink rain–water which they collect and eat just enough to stay alive; they support themselves by weaving baskets and making rosaries, which they sell or exchange for food. My own hesychasterion does not resemble that of Karoulia! Hermits are, by their very nature, a problem for the Church as an institution. Typically eccentric individualists, they neither require nor seek bureaucratic authorization or supervision, and tend to be resistant to rules and regulations. The earliest of the Hermits were what one might call “self defined” – they went into the desert and lived as Hermits. They sought neither permission nor blessing nor recognition. Originally the Church seems to have adopted the “ignore them and they’ll go away” approach. It was only when people felt attracted by the Hermits and sought their teaching, counsel and prayer that they came to represent a problem. Not unlike the Russian starets (Russian: стáрец, fem. стáрица), an individual to whom high spiritual status, authority and wisdom was attributed by the people regardless of whether he or she had any formal recognition from the Church. One institutional response was to require Hermits to become Monks or Nuns and to live within (or at least on the edge of) formal, canonical communities. They therefore fell under the established canonical rules and procedures and authorities. This was not only the Roman Catholic response. The Coptic Orthodox Church, for example, has in modern times required that a Hermit be an old and experienced member of a monastery, the Hermit being re-defined as some sort of advanced monk. This led, more or less, to the apparent disappearance of the Hermit. Institutionalization is the very antithesis of the eremitical life. There is nothing wrong with, and much good about, coenobitic monasticism. It is just not the life of the Hermit. Unseen, unknown and unrecognized (all entirely appropriate eremitical characteristics!) Hermits continued to live the life of the Desert. In modern times, in the world of mass communication, the existence these “relics” of the ancient deserts became more widely known. Once again, the institution of the Church was confronted with the (apparent) problem of the eccentric individualist who appeared to have some religious status by charism rather than by official appointment. Rome sought to deal with this in the case of Hermits who did not desire to belong to a coenobitic religious order (for example Benedictines, Cistercians, Trappists), or to an eremitically oriented religious order (for example Carthusian, Camaldolese), by the provision in the Code of Canon Law 1983 regarding the Consecrated Life (canon 603) which stated: “A hermit is recognized in the law as one dedicated to God in a consecrated life if he or she publicly professes the three evangelical counsels confirmed by a vow or other sacred bond, in the hands of the diocesan bishop and observes his or her own plan of life under his direction.” Roman Catholic Hermits can thus be “certified” (as it were) and specifically subject to ecclesiastical authority, or “independent” and subject to no ecclesiastical authority beyond that which applies to all (lay) members of the Church. The Rudder (Pedalion)(Greek: Πηδάλιον) is a codification of Orthodox Canon law by St. Nicodemus of the Holy Mountain. 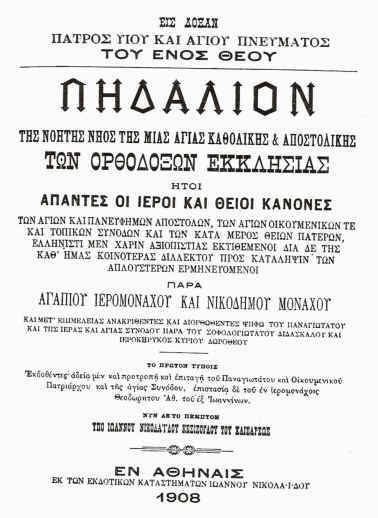 This is the title page of the 5th edition (1908). The Canons of Orthodoxy (which really does not have a system such as could be described as “Canon Law”) are more or less chaotic, and make no specific provision in relation to Hermits. (iv) Hermits who (regardless of their ecclesiastical status) have been accepted as Hermits by the relevant episcopal authority. There is nothing in the Orthodox Canons preventing a Bishop from blessing someone as a Hermit on such conditions as he determines, or blessing the establishment of a Hermitage. As is the case with Roman Catholic Canon Law, there is no prescribed rite for either the blessing of a Hermit, or of a hermitage. In some ways, the eremitical life can be easier in Orthodoxy, not just because of the chaotic Canonical situation, but because the definition of the religious life (i.e. monks and nuns) has always been more fluid. There are no religious orders as such which a monk or nun is required to or can join and, accordingly, there is no reason why a monk or nun must live in community. It is traditionally possible for a monk to live in his own home (for example, the hesychasterion) or in a house with only one or two others (for example, the skete), or to live (with or without monastic profession) a religious life giving service to the community (for example, the poustinik). 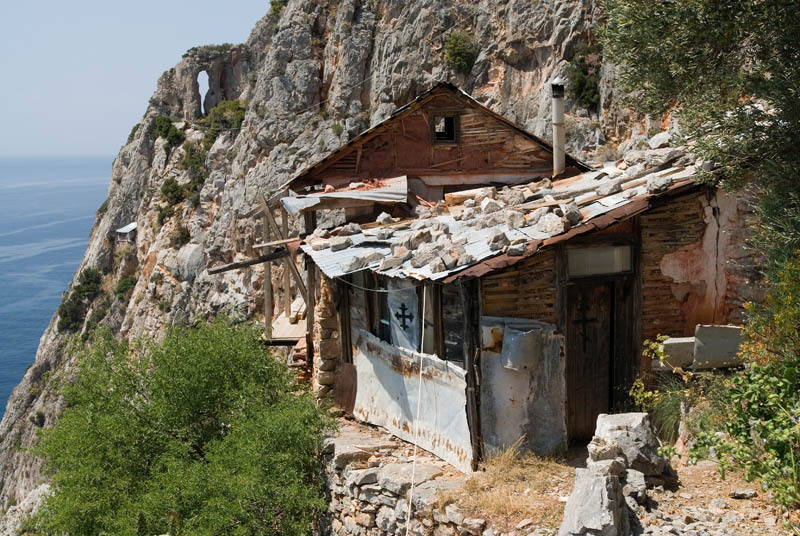 The model most closely fitting that of the modern Orthodox urban Hermit is the hesychasterion which is a small cell or hermitage where intensive hesychasm is practiced, distinct from the cenobitic hesychastic life of a monastery. Legally and canonically, a hesychasterion is a hermitage established with the blessing of the diocesan bishop but owned by the monastics of the hermitage, as distinct from a monastery, which is owned by the bishop. 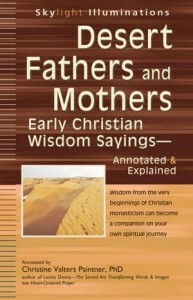 An excellent and inspiring site is Abbey of the Arts – http://abbeyofthearts.com/about/monk-manifesto/ – from Dr Christine Valters Paintner, author of, amongst other works, “Desert Fathers and Mothers: Early Christian Wisdom Sayings, Annotated & Explained” (1912). The site includes Monk Manifesto: A public expression of your commitment to live a compassionate, contemplative, and creative life. 1. I commit to finding moments each day for silence and solitude, to make space for another voice to be heard, and to resist a culture of noise and constant stimulation. 2. I commit to radical acts of hospitality by welcoming the stranger both without and within. I recognize that when I make space inside my heart for the unclaimed parts of myself, I cultivate compassion and the ability to accept those places in others. 3. I commit to cultivating community by finding kindred spirits along the path, soul friends with whom I can share my deepest longings, and mentors who can offer guidance and wisdom for the journey. 4. I commit to cultivating awareness of my kinship with creation and a healthy asceticism by discerning my use of energy and things, letting go of what does not help nature to flourish. 5. I commit to bringing myself fully present to the work I do, whether paid or unpaid, holding a heart of gratitude for the ability to express my gifts in the world in meaningful ways. 6. I commit to rhythms of rest and renewal through the regular practice of Sabbath and resist a culture of busyness that measures my worth by what I do. 7. I commit to a lifetime of ongoing conversion and transformation, recognizing that I am always on a journey with both gifts and limitations. February 28 marks the Feast of Saint Romanus of Condat. St. Romanus was born in about the year 390 in upper Bugey. At the age of 35 he undertook to live as a hermit, in prayer and asceticism, in the region of Condat in the Jura mountains of southeastern France. His younger brother Lupicinus followed him there. They became leaders of a community of monks which included St. Eugendus. Romanus and Lupicinus founded several monasteries. These included Condat Abbey, which was the nucleus of the later town of S.-Claude, Jura), Lauconne (later S.-Lupicin, as Lupicinus was buried there), La Balme (Beaume) (later S.-Romain-de-Roche), where Romanus was buried, and Romainmôtier (Romani monasterium) in the canton of Vaud in Switzerland. Romanus was ordained a priest by St. Hilary of Arles in 444. He reposed in the grace of Christ the God-Man, in about the year 460. Holy Venerable Romanus, pray to God for us! 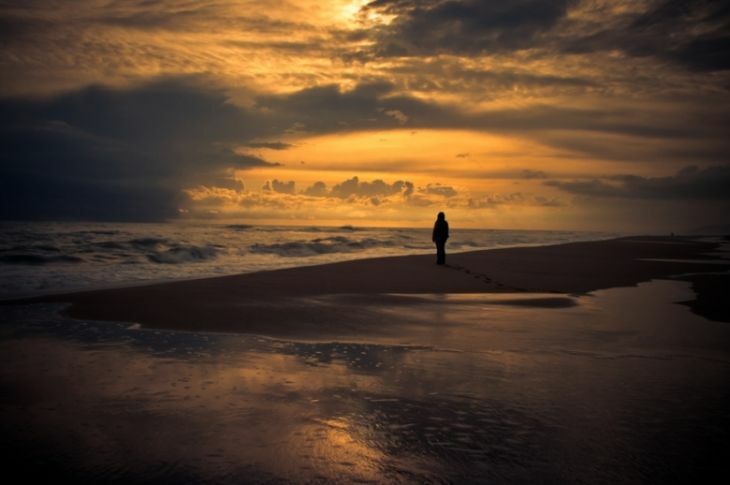 Romanus had seen that it was very easy to forget about God in this world, so, at the age of thirty five, Romanus decided to go away to a quiet place and live as a hermit. First, he asked the advice of a holy monk, and then he started off. He took a book with him called “The Lives of the Fathers of the Desert” by St John Cassian. He also took seeds to plant and a few tools. With these supplies, he went into the forests of the Jura mountains between Switzerland and France and settled down beneath a huge fire tree at a place called Condat. There he found a spot of land good for growing his garden and food, and some trees from which he could eat a kind of wild fruit. He spent his time praying and reading his book. He also planted and cared for his garden, quietly enjoying nature. Soon afterward, his brother Lupicinus joined him. Romanus and Lupicinus were very different. Romanus was hard on himself but he was kind and gentle and full of understanding with others. Lupicinus was tough and very strict with himself and usually the same with others but he only meant good and did not do it to hurt anyone. The two brothers understood each other and got along peacefully. Many men came to join them. They wanted to be monks, too, so they built two monasteries. Romanus was the abbot of Condat (now Saint Claude) and Lupicinus was the abbot of Leuconne. Later they built the convent of La Beaume for nuns (now St. Romain de la Roche). The monks lived simple, hard lives. They ate simple food which was mainly bread made of barley or bran and pulses and slept on the ground or on hard boards. St. Lupicinus wore a tunic made of skins of animals with a cowl: and wore wooden shoes. They prayed much and made sacrifices cheerfully. They did penance to strengthen themselves against the temptations of the devil. They worked very hard farming to grow their food and kept silent all the time. They lived like this because they wanted to grow close to God and when they were silent they were able to pray and talk with God. Their lifestyle helped them become more holy. 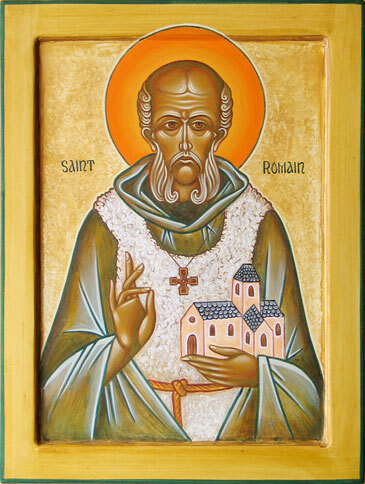 St. Romanus died in 460 and was buried at the abbey of Beaume. His younger brother, St. Lupicinus, died in 480. Two lives of him are in existence: one by Gregory of Tours in the Liber vitae patrum (Mon. Germ. Hist. : Script. Merov., I, 663), and an anonymous Vita Sanctorum Romani, Lupicini, Eugendi [ibid., III, 131 sqq. ; cf. Benoît, “Histoire de St-Claude”, I (Paris, 1890); Besson, “Recherches sur les origines des évêchés de Genève, Lausanne, et Sion” (Fribourg, 1906), 210 sqq.]. The words were modified extensively by Percy Dearmer for the 1906 “The English Hymnal”. At the same time it was given a new tune by British composer Vaughan Williams using the traditional Sussex melody “Monk’s Gate”. The hymn has also been sung to the melody “Moab” (John Roberts, 1870) and “St. Dunstans” (Charles W. Douglas, 1917). John Bunyan (28 November 1628 – 31 August 1688) was an English Christian writer and preacher, who is well known for his book “The Pilgrim’s Progress” (1678-1684). Though he became a non-conformist and member of an Independent church, and although he has been described both as a Baptist and as a Congregationalist, he himself preferred to be described simply as a Christian. From the ever wonderful Hermitary – http://www.hermitary.com/lore/macaulay.html – “An Hour With the Hermits,” by Marybella Macaulay; “The Irish Quarterly”, v. 21, August 1893, p. 443-446. 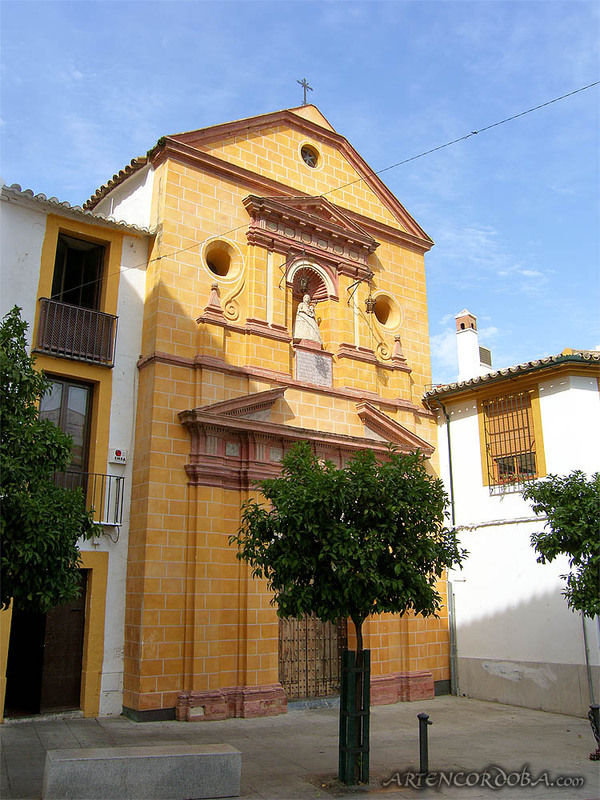 This brief 19th-century Irish travel essay about Cordoba, Spain, captures the remoteness of an unnamed monastery. Wistfully infused in the essay is an exoticism about ruins, mountains, and silence that culminates with arrival at a monastery of hermits. “We pity these men who lead such austere lives with no companionship, none of the comforts, and scarcely the necessaries of life; at the same time we cannot but admire their greatness of soul in being able so to break all human ties and devote their lives to praising God and praying for others and preparing themselves for the other world, which will last longer than this. They do well to go so high up the mountains, for it lifts their thoughts beyond the clouds so near them. You are currently browsing the Citydesert blog archives for February, 2013.